What It Is: For kids who are just learning to read or who are struggling with reading, The Reading Game combines a memory card game, picture flashcards, and storybooks to make learning to read fun. There are six storybooks with different difficulty levels, three picture flashcards for each book, and six sets of 10 memory cards for each book. You start off with the easiest level cards, flashcards, and storybook. 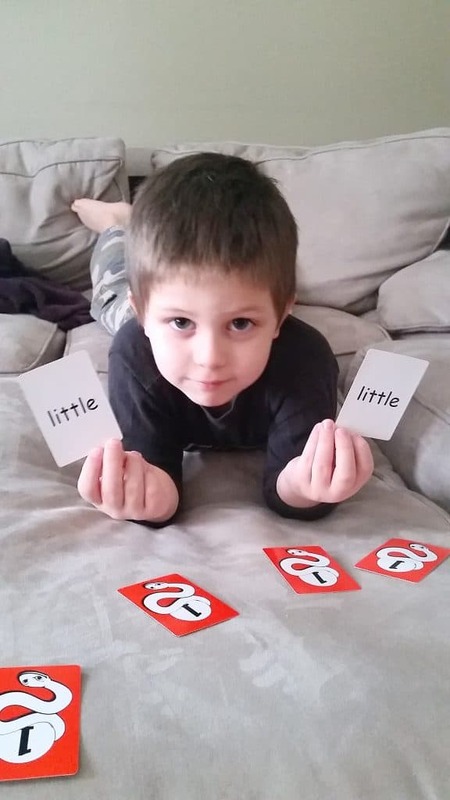 Play a simple memory match game with the cards to find matching words, and then reinforce the learning of those words by reading the captions underneath the pictures on the flashcards. Once the child feels confident with all 30 new words, read the storybook. Then repeat the sequence through the other five difficulty levels. The Reading Game is for two or more players with at least one of those players being a tutor, teacher, or parent. Is It Fun? This game offers a fun challenge for kids just learning to read or for kids who need help with their reading skills. We like that there are three ways to play in each difficulty level, and that there is a lot of reinforcement of the words kids have learned throughout the play. Who It’s For The Reading Game is for two or more players ages 4 and up. It's for beginning and struggling readers. What To Be Aware Of This does work best if a parent or teacher is playing along with a child to make sure that the child doesn't move forward in the game before he or she is ready. Reading is one of the most important tools one can learn throughout their life. Thinking back to how I learned to read is very different to how my son, and daughter are learning to read. Over the years companies, as well as many educators have come up with fun new ways to have children engage and learn to read. Some of my proudest moments as a mom is watching Benjamin read an entire book, and seeing him happy with what he’s accomplished. Over the weekend we played a game called The Reading Game that allowed him to play a game with his parents, but was also educational. To read the full review from "Things In Review", part of the Blogger Recommended Network click here. We love memory - in fact we have about three different editions (Paw Patrol, Mario and Safari Animals) of memory games. So when we got the chance to review The Reading Game and I told my kids it was a memory game, it was a hit before we even opened the box. My 6-year-old is a "new reader" but was ready for the level of this game and my 4-year-old struggles to keep up with the brothers so the Reading Game met it's match with my bright boys. They loved it! Being able to pick the "penguin" series was my 4-year-olds favorite part. Mamas are always looking for fun, educational games that can help kids get a jump start on mastering early reading skills. So when we found the The Reading Game, we knew we had to tell you all about it. "This resource is super easy to use! I have had the pleasure of using The Reading Game in my classroom for the past month and I am beyond impressed with the growth my struggling students have made by "playing" this game." Read the whole teacher review at "More Than Math Blog"
Learning With Mrs. Leeby's Blog about The Reading Game! Have I told you that I'm in love?! I'm in love with, The Reading Game! We have been using the first set of word cards and the first book, "Skunk." Disclosure: I received the below product to facilitate this review. All opinions are my own. 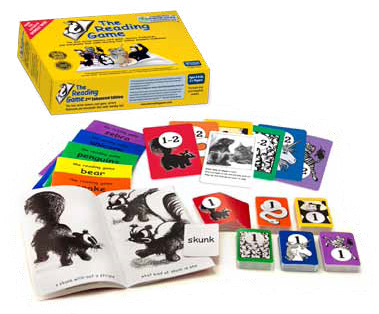 There are 6 complete “levels” to this reading system starting from left (skunk) to right (zebra). Everything is color coded and extremely simple to follow. When all of the levels are complete your child or student will have learned 180 vocabulary words, many of them Dolch and High Frequency words. (Plus if you use Wordly Wise like we do – this game is by the author of Wordly Wise!) Ok – so 6 levels – let me break it down extremely simple for you. I’ll show you how the first level works and every level after that is the exact same for it’s color. Every level is themed by an animal and color coded. The skunk here is all red. The FIRST step is to take the number 1 cards you see at the top left and lay them out – it will be a memory matching game with the vocabulary words. Once the child has learned the words and paired up matches in the memory game you move on to the number 2 memory card words. Once that is completed the child has earned the 1-2 Skunk Flashcard you see at the top left. On the back of that card is a picture and paragraph that the child can read which uses only the vocabulary words they just learned in the memory match game. After that they can go through memory matching game cards 3 and 4, earn flashcard 3-4, then finish up with memory matching games 5 and 6 and earn flashcard 5-6. At this time the child is rewards with the very first book in the series!! Not only is the book a large size like an older child’s book (not the tiny “See Jane Run” books) but the illustrations are also fantastic! The entire book is only created using the memory card vocabulary words to ensure that the child can read it. My son noticed right away that it was like a “real” book, not a “baby” book as he calls his BOB books at school. Let me tell you a little about my son. He is a very smart child and ahead of the kids in his class, but he does NOT like to work at all – I can’t tell whether he is lazy or bored! Either way he hates being required to do school work of any kind. However the first day I showed him The Reading Game he literally spent FIVE STRAIGHT HOURS reading. I was absolutely floored. Every day he comes to me wanting to do more memory card games so he can get his books. I am incredibly proud of him. I don’t let him take the memory cards until he says aloud the vocabulary word every time he flips the card. After he earned his Skunk book he moved on to the Snake cards and book. I freaking LOVE this reading game set. 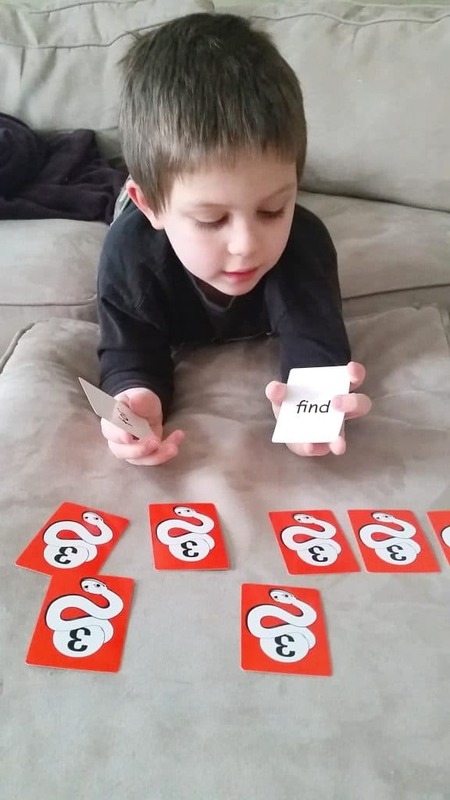 It makes learning to read fun with the memory card game and my son feels like he is earning a reward every time he gets a flashcard and ultimately a book. We’re currently half way through The Reading Game and my son often brings the game to me saying he wants to work on his next animal. Each memory card game teaches only five new words at a time. The stories are funny and clever and of course everything meets Common Core Standards. Overall – this is hands down the BEST, easiest, and most encouraging reading system I’ve encountered. I HIGHLY recommend it! It’s great for beginning readers like my son as well as for struggling readers up through the 4th grade. You can find out even more details onThe Reading Game’s website and can even purchase it here on Amazon. The Reading Gameis a game designed for ages four and up. The game needs at least two players.One of the players needs to be the tutor. The tutor must be able to read all the words on the cards before play begins. This game was designed by the daughter of Kenneth Hodkinson, creator of the extremely popular vocabulary curriculum Wordly Wise. A student learns to read a set of five words by playing a simple word matching game. The words learned are Dolch sight words and half-frequency words. For example, in the first game: Skunk Game 1, students learn five words: can, cat, is, me, and not. 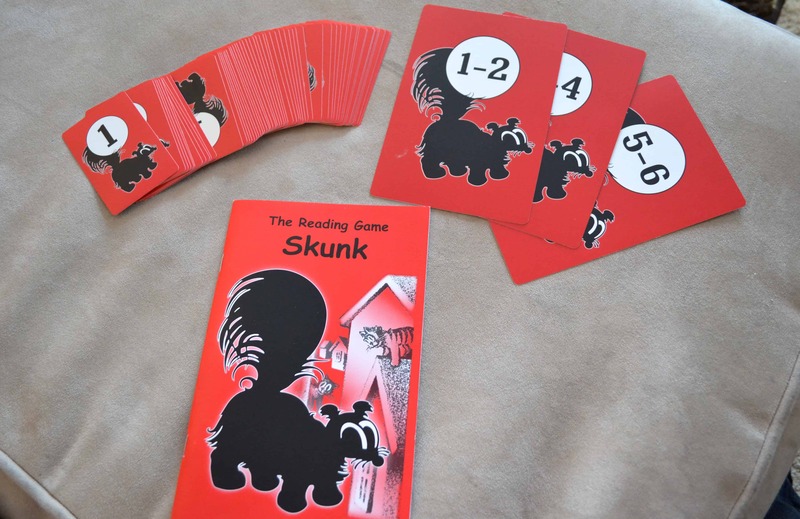 Once the student completes Skunk Game 6, they are ready to read the Skunk Book. 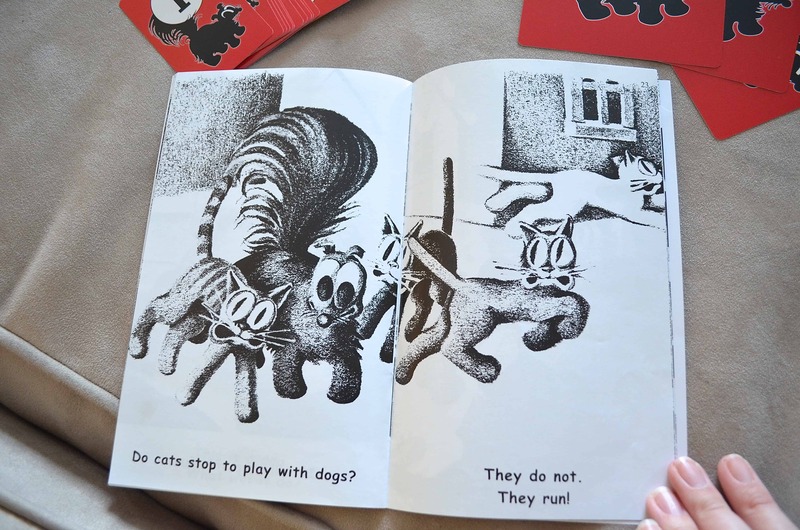 The first book tells the story of a skunk who is rejected by the other skunks before being accepted by some cats. Beautifully illustrated, it is 32-pages long and is told using just thirty new words! Each subsequent matching card game and book set in the series adds a further thirty words. This means that when they finish this game, students will have mastered 180 words! We have three children in our homeschool group in the “learning to read” section of their education. They are 4, 5, and 6. I tried the game with each of them. The four-year-old was clearly not ready and could not really get a handle on the game. The five-year-old understood what was going on, and while moving along slowly, was able to progress. However, the six-year-old who is not reading much yet, began zipping through and was reading incredibly quickly. Each set of cards is a distinct color: red, yellow, green, blue, and purple and is visually pleasing to young and old alike. I believe this is a fantastic program for giving kids instant success to reading and slowing them to feel that reading is within their grasp. I strongly recommend it to new and emerging readers! And here is an exciting bonus!!! Following your student’s mastery of this reading game, you have the option to purchase a program called Magic Stories which is a step up from The Reading Game. You do not have to use The Reading Game to useMagic Stories. Magic Storiesis a set of six delightful stories appropriate for second and third grade reading levels. These were well beyond the young children I was using to test the game on but were much more appropriate for my seven-year-old who is reading at about a second-grade level. Each story comes with its own set of Naughty Forty™ words. These are more challenging words that your child will encounter when reading the story. There are also four sets of worksheets per storybook that come with the program featuring reading comprehension and creative writing exercises. The worksheets cover a range of language art skills like recall and comprehension, cognition, and creative writing. The stories are optimized for an IPAD and computer screen. I chose to print them out and try them with my daughter.Each book is around 20 pages long and allows your child to color in the drawing and sketches that accompany the story. I love this idea! I look forward to incorporating Magic Stories more with my children as they learn to read! 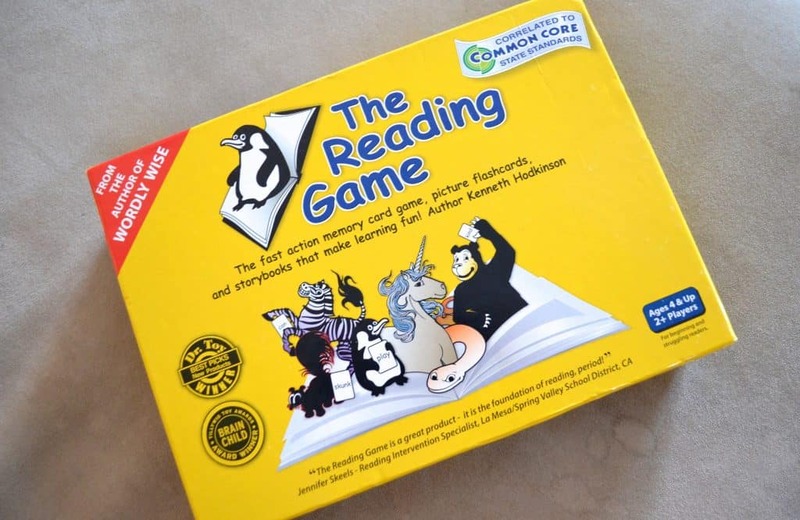 "If you are looking for a fun yet educational way to encourage your child or student to read then give "The Reading Game" a try. It will help build self esteem while teaching sight words that will keep kids attention" ... read the whole review and enter to win a copy of The Reading Game at "From Praises of A Wife And Mommy"
"The frequent play and fast-paced nature of the matching game stimulates students' long term memory; providing your student with the knowledge and confidence to successfully read the book at the end of every level. Kids also love the sense of accomplishment and constant positive reinforcement they enjoy through play. It's not school, it's a game!" Reviewed by Janet Esposito for Homeschool Magazine on June 5th, 2014. "If you are getting ready to teach your child to read or struggling to teach your child to read, this post is for you. I have posted in the past about my daughter who is a struggling reader…I am pleased to say with The Reading Game we have been experiencing breakthrough upon breakthrough! Yes!! I knew she could do it. In the past we have tried method after method of getting her to read without sounding out every s-i-n-g-l-e sound…ugh! I don’t know how many times I say a day “if you know the word just say the word.” But she just either forgets easily, doesn’t grasp the concept or just plain didn’t want to…lol! I was stumped and frustrated and just as the feeling of hopelessness tried to consume me, we were given the opportunity to try The Reading Game. I cannot tell you enough about how this game has changed the way she reads, she is actually reading and not slowly blending anymore, she gets it…YES! (queue the Hallelujah Chorus) I’ve always read to my children, but I love it when they can read to me too! I know that not everything is for everyone…But I will have to say I have struggled to teach my child and this game me real help & her confidence has tremendously increased. Now all the other methods that I have used with her work, but The Reading Game was what got the ball rolling with my hands on learner. We have a lot of fun playing and aren’t even half way through the game yet. But let me tell you this game is always on her mind, she loves it so much she asks constantly to play, she loves the fact that she is actually reading now and has become so much more excited to try all the other methods again…love it! I hope this post will encourage that mom out there that is dealing with a struggling reader, there is hope, just keep on trying and something is bound to work." "Is your child just beginning to read? The Reading Game is a fun supplement for reinforcing early readers through simple, fast-paced card games and storybooks. Once your child can recognize letter sounds, he or she is ready for The Reading Game. for children who enjoy more active learning. 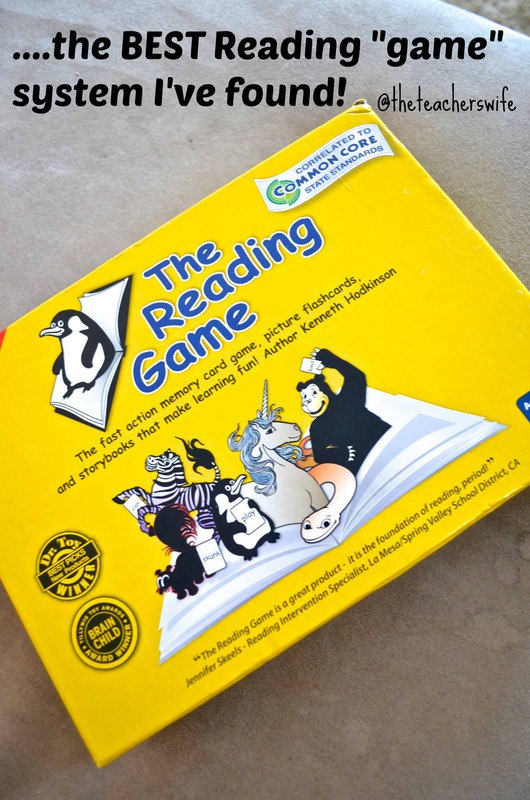 “The Reading Game is one of my favorite hands on games/activities for children learning reading skills. The format is simple, effective and fun. The fun is not due to compromising on quality or building a solid foundation. In fact, the format is exactly the right way to teach and could run the risk of being considered boring if not for the "game" and reward of reading a story." “The first thing you will notice about The Reading Game is its quality. If you're anything like me, you get discouraged by how quickly the boxes on your kids' games seem to disintegrate, first splitting at the corners, and then ripping up the sides. That is not going to happen with The Reading Game. Everything from the box to the soft cover storybooks to the laminated and damage-resistant cards is of the highest quality. This is a game that will stand the test of time. If you happen to be fortunate enough to have younger readers in your home, you will be using this game quite frequently! Oh how I love The Reading Game! “Sight word learning is the way my girls have learned to read. All of them have struggled in one way or another with phonics alone. So this game has provided a new way for my girls to see the words and the best part was they didn't feel like it was school! “How precious it was to see (my daughter’s) eyes light up when she realized that she made a match and then to recognize a word she may have just learned - oh, that was just icing on the cake. This inspired her to want to learn more and more and more words. She didn't want to do any other school because she was making such progress with The Reading Game. -The Ramblings and Adventures of S.A.H.M. “I highly encourage you to check out this game. I am so excited to tell you all about this new guided reading game we have been using in class. I absolutely LOVE it. It is so simple to use and my students are crazy about it. I'm a firm believer in this one. I want my friends to know about it. "I'm using Allsaid & Dunn's The Reading Game, and the flashcard system is opening up reading to these kids in ways I barely dreamed of before." “The stories are well-written, they seem like “big-kid” stories. The feeling of accomplishment by the reader is palpable! 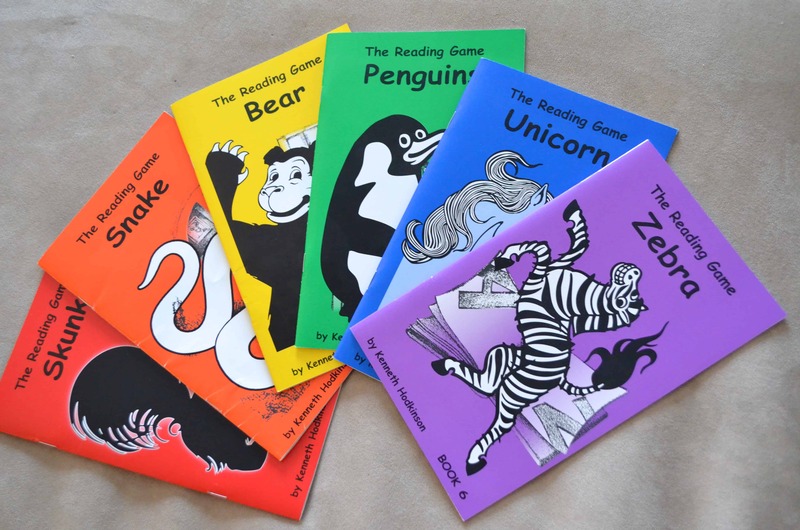 The Reading Game is a well researched, supplemental reading program, that promotes long term retention of words. It is serious FUN! 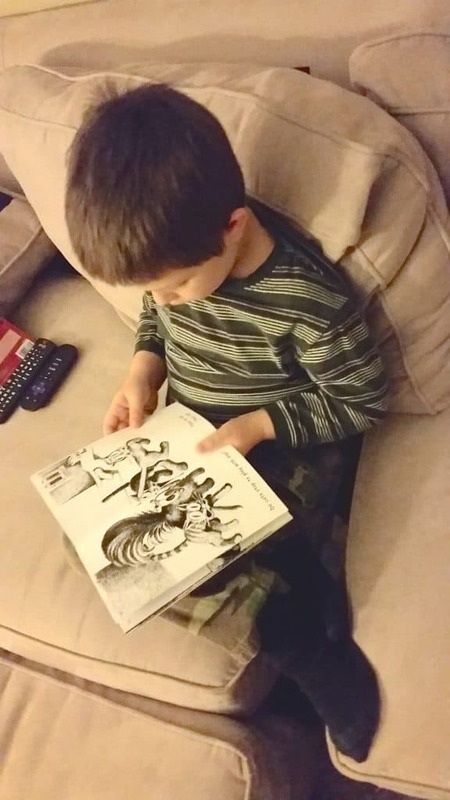 “This is one of those tools that I wish I had discovered years ago to use with my first child when I was teaching him to read!"